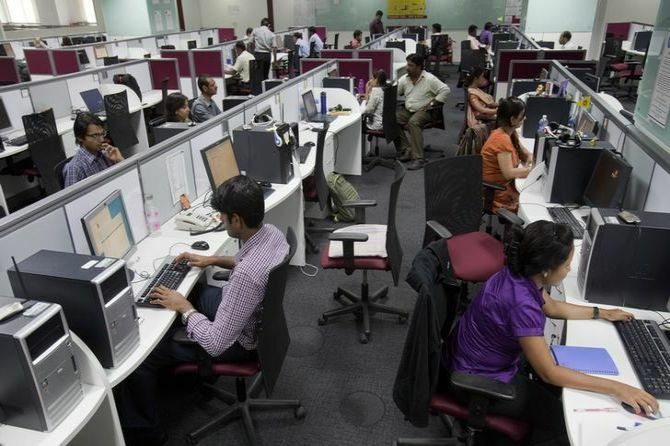 India's services sector activity fell in August from July's 21-month peak as new business orders declined, following which firms raised their staffing levels at a modest pace amid rising input cost inflation, a monthly survey said on Wednesday. 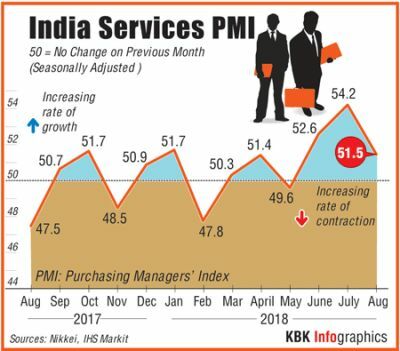 The seasonally adjusted Nikkei India Services Business Activity Index, fell from July's peak of 54.2 to 51.5 in August owing to weakest growth in new work in three months. In PMI parlance, a print above 50 means expansion, while a score below that denotes contraction. "August data signalled that the pace of growth in India's service economy cooled from July's recent peak. This was matched by the slowest expansions in new business and employment since May and November 2017, respectively," said Aashna Dodhia, Economist at IHS Markit, the author of the report. Meanwhile, the headline seasonally adjusted Nikkei India Composite PMI Output Index fell to 51.9 in August from July's 21-month high of 54.1, owing to weaker growth in both the manufacturing and service sectors. On the price front, input cost inflation was the strongest in nine months. On a positive note, business confidence rose to the highest level since May. "Input cost inflation in the service sector accelerated to the sharpest since November 2017, fuelled by higher oil-related prices," Dodhia said adding that firms faced pressure on their margins as they were unable to fully pass on higher cost burdens to price sensitive customers. The Reserve Bank of India in its August policy review, raised benchmark short-term lending rate (repo) by 25 basis points to 6.5 per cent citing inflationary concerns. It was the second such hike in a row. Meanwhile, business confidence remained positive in August and was driven by upbeat forecasts of sales, an expected improvement in demand and promotional activities, the survey noted. "On another positive note, business sentiment towards the 12-month outlook strengthened to a three-month high, with stronger confidence seen among service providers," Dodhia said. "Amid reports of strong demand conditions, the overall economy registered in expansion territory for the sixth consecutive month," she added.